No matter what we say about roses, it has definitely been said or written somewhere before. It couldn't be any other way! After all, roses have been the most beloved flowers in the world since time immemorial. 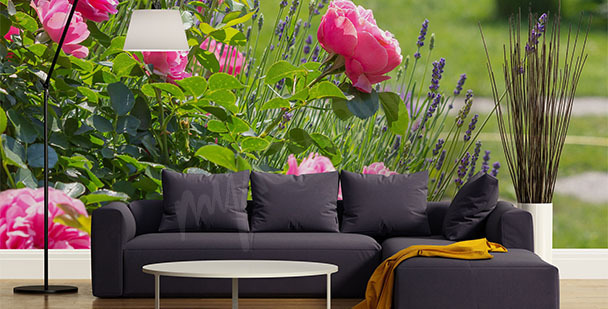 It's no wonder that rose wall murals are some of the most popular designs in our catalogue! 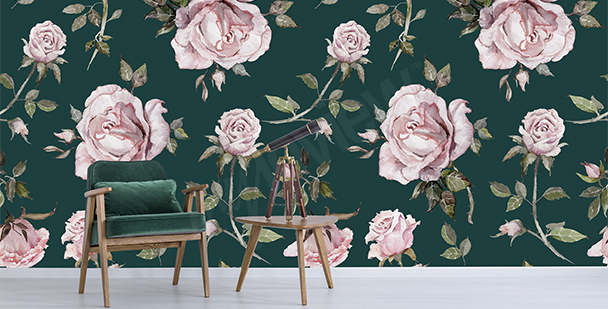 Thanks to their great charm and timeless beauty, rose wall murals can prove to be an excellent choice for decorating many interiors in various styles: both the traditional and the ultramodern ones. 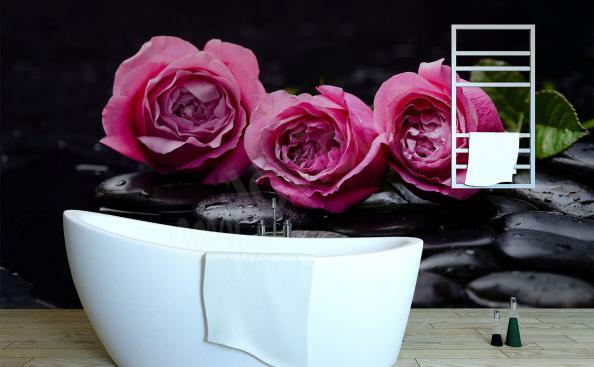 All you need to do is choose the appropriate design; we are certain that we can find a rose mural for every interior! How to start? Keep on reading, we have a few ideas for you! 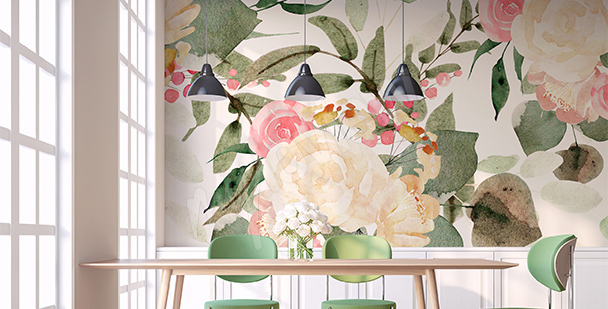 An expressive color on a mural will emphasize the modern decor of a living room and the rose motif will become an interesting decoration of your interior. A subtle white rose will improve a minimalist space by giving it an elegant character. A feminine bedroom must have some flower-themed decorations, such as a rose mural. A minimalist mural with a white rose can be placed on a wall of an eclectic living room or a small studio apartment. 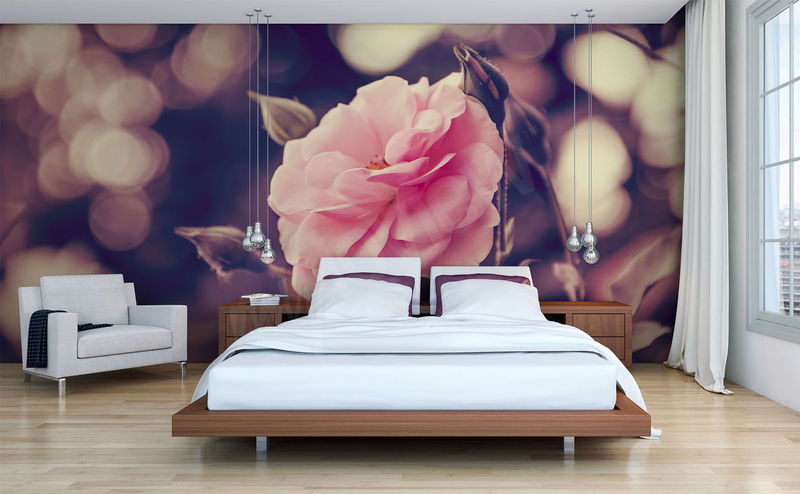 A mural with macro photography of a white rose will make a classic bedroom interior look lighter. A rose garden on a mural, placed in the front hall, will optically increase the narrow space and make it look more dynamic. If you dream of having a romantic interior decoration, choose an eye-catching wall mural with an image of lavender and roses. A patchwork-like graphic design is a suggestion for an eclectic living room or vintage-style interior. A rose design will appeal to enthusiasts of classic trends with a modern twist. 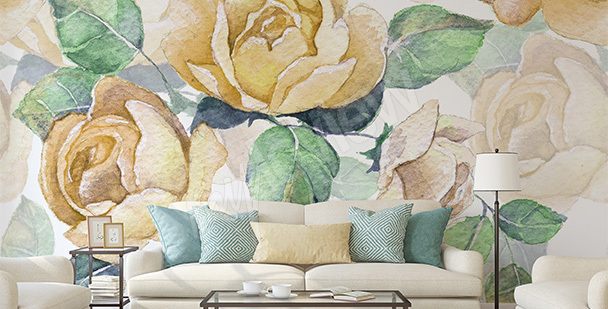 A mural with roses will improve a boring living room. It will become an expressive, yet elegant decoration. Rosy designs are one of those universal motives, which have been popular since forever: they can be found among the mosaics of the ancient Rome, on medieval tapestry, on works of applied arts from the art nouveau period, and on Instagram. It's no wonder: roses are widely considered to be the most beautiful of flowers. 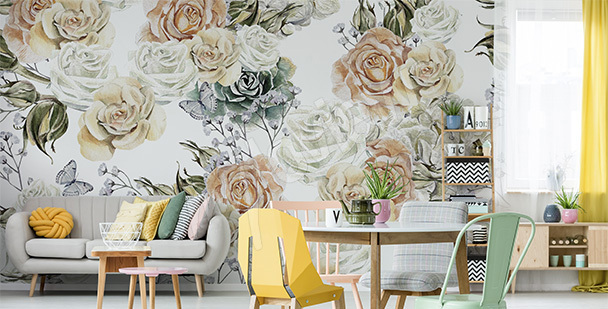 Our rose wall murals are only the most recent iteration of a continuous trend which has been popular for millennia! Floral murals, especially the ones with roses, are a decoration which you can use in multiple types of interiors. 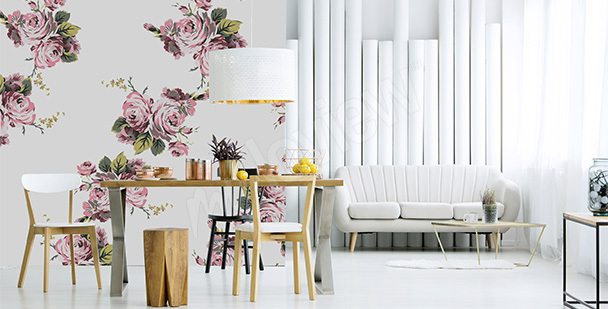 Depending on the unique character of your space and the style of arrangement, you can go for different rose murals – from the most traditional ones, reminiscent of the great baroque damask roses, all the way to the ultramodern ones, such as the fractal rose mural, which has recently been gaining on popularity despite being vastly different from what we usually consider a floral motive. How to pick a design appropriate for your interior? Here are some suggestions! In the language of flowers, white roses symbolize innocence but also mystery and the necessity to keep a secret. 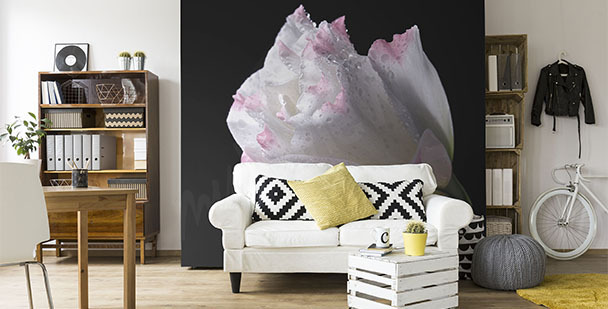 This is exactly the effect you'll achieve if you decorate your interior with a white rose wall mural. It will look subtle, elegant, and sophisticated at the same time. If you prefer well-known motives, choose a medium size rose design. It is suitable both for more spacious and smaller interiors, especially if the decorated wall is partially covered by furniture. However, if you wish to decorate a bigger space where there is a large, empty wall, go for a more daring motive, such as a macro photograph showing a stunning close-up of a white rose. It's an awe-inspiring, almost abstract design, which will complement any modern arrangement beautifully! 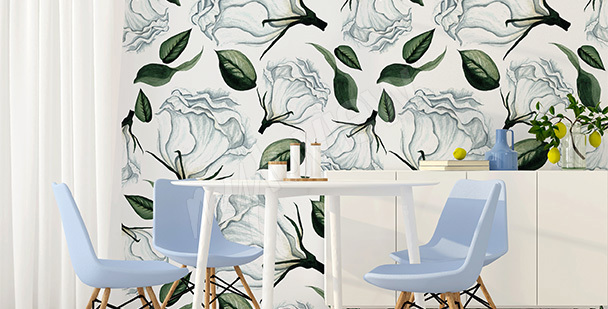 A white roses mural is ideal for decorating bedrooms, but also beauty salon or even an elegant coffee house. A mural for people who dislike plants? The fractal rose mural is currently one of the most popular rosy decorations. You could say it's a decorative option for people who aren't big fans of flowers! At its core, it is an abstract design which only roughly resembles a partially open rose bud. To a greater extent it may bring to mind a colorfully illuminated smoke spiral. It is a great choice for really modern, even extremely minimalistic living rooms, as a way to give them a "softer feel" with the help of a nature-inspired motive. 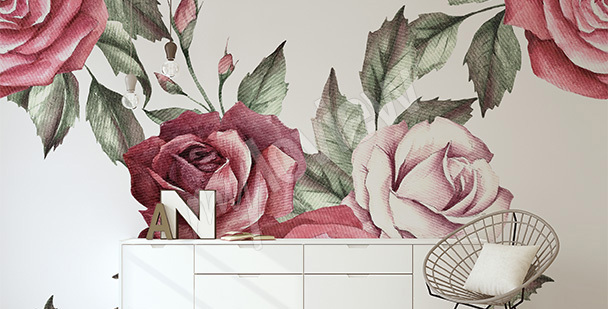 Remember: this type of rose mural looks best when the wall isn't obstructed by furniture or other objects. Real roses wither, a roses wall mural does not! This is the greatest advantage of floral decorations over real flowers: in contrast to a bouquet in a vase, they survive for many years! 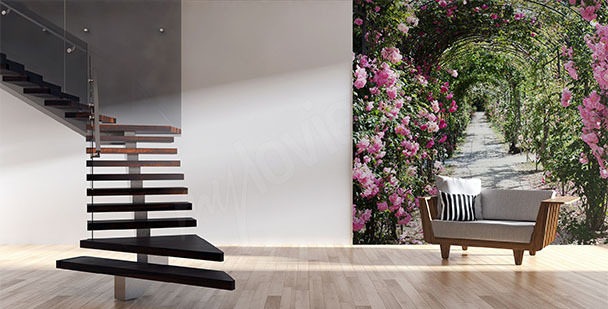 No matter what rose wall mural design you decide on, you can be sure of its outstanding production quality. All our products are printed with the use of the state-of-the-art latex print technology – HP Latex. Not only do they look hyperrealistic (just like in the preview in our online catalogue! ), but they are also characterized by their incredibly vivid colors, which do not fade even in brightly lit interiors. What is more, HP Latex technology ensures that the print is odorless, nontoxic (which is why the murals are also suitable for decorating public spaces), and also washable: in order to clean it, simply wipe the surface softly with a wet cloth or a sponge.